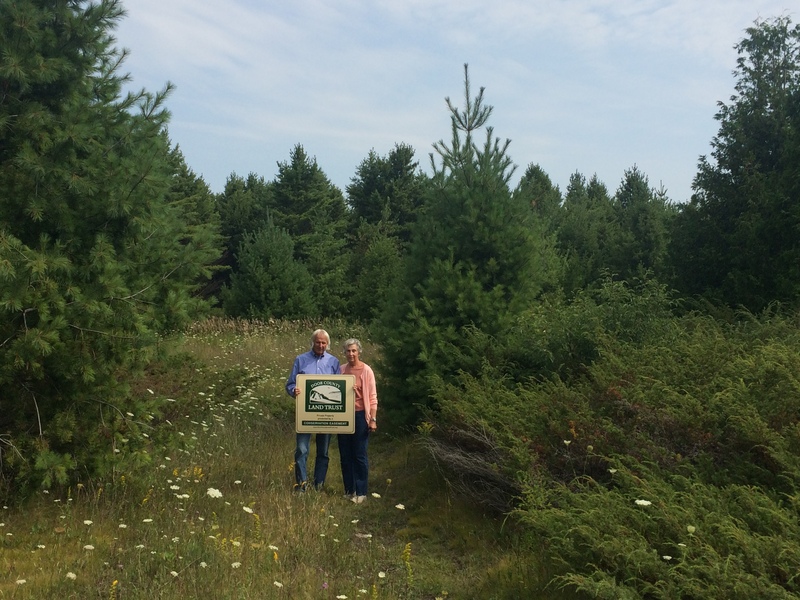 In late August, landowners Bruce and Joan Pikas donated a 37-acre conservation easement on their boreal forest tract to the Door County Land Trust. The conservation easement adds to existing protected land in the area which includes several other conservation easements, The Nature Conservancy’s Mink River Estuary and the Land Trust’s Three Springs Nature Preserve. Ten rare plant species and 15 rare bird species are found within this protected landscape. “We love walking the property in every different season. We see turkeys, coyotes, porcupines, ruffed grouse….And we want to make sure that will never change,” says Bruce. More than 150 species of birds have been documented migrating through nearby protected lands. Door County Land Trust’s land protection specialist Drew Reinke says, “Conservation easements are a key tool for protecting wildlife corridors and ensuring opportunities for wildlife to move freely across the landscape, while keeping the property in private ownership.” A conservation easement is a legal agreement made by landowners which protects the ecological value of property forever, regardless of future ownership. Protection of the Pikas property adds to current conservation efforts of the Door County Land Trust and the Nature Conservancy in this area. The most southern extents of Arctic boreal forest in North America are found along the Lake Michigan shoreline area of northern Door County, making the boreal forest of the Pikas property particularly significant. To the east of the property is the North Bay Lowlands Area which contains several high quality wetland communities. The property also lies within an 11,000-acre coastal wetland corridor recognized as a “Wetland of International Importance” by the Ramsar Convention.